Please note that there is a much bigger and better collection of photos of H.E. 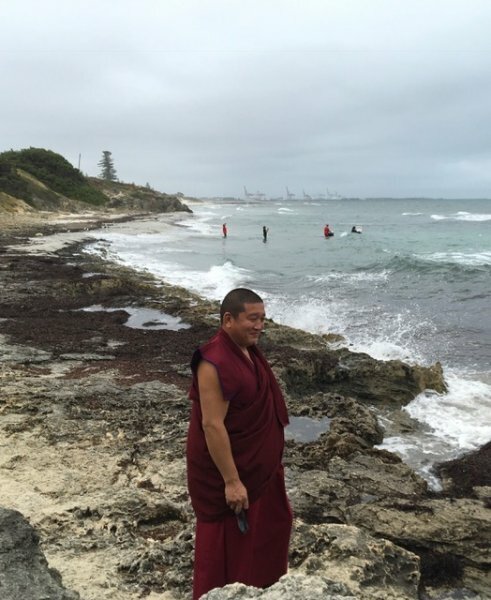 Kyabje Ling Rinpoche’s arrival in Perth on his Facebook page. Follow this link to view those photos. Once on Facebook, click on any of the photos to launch the carousel viewer. You should not need a Facebook account to view these photos. 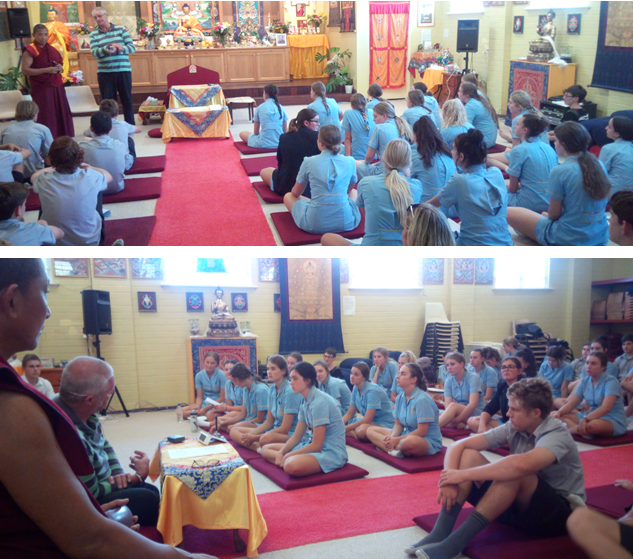 Geshela spoke briefly in English to the Year 11 girls and boys from Iona and Christian Brothers Colleges. This was followed by John Waite who explained how Buddhism can help us handle our emotions better and that a scientific approach is encouraged to develop a deeper understanding of our experiences. The students then were given a taste of meditation and kindly gave us some gifts including a white lantern symbolising the practice of Christianity during difficult times. Buddha performed 15 miracles over 15 days to inspire his followers. 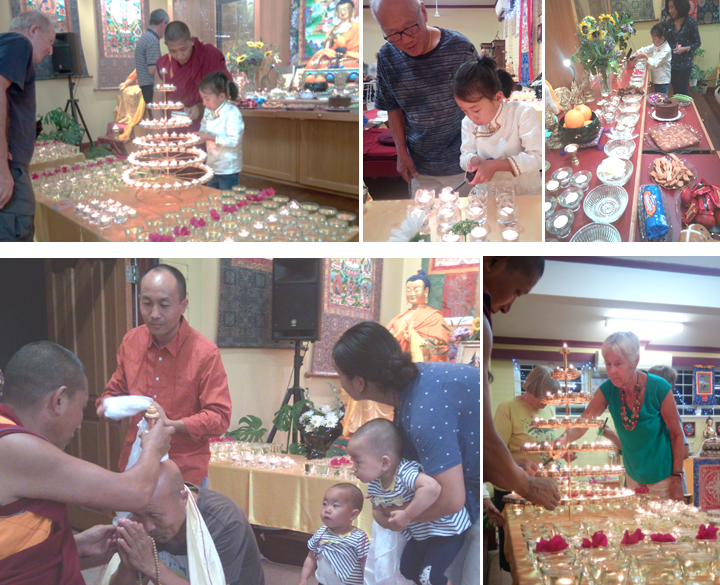 Start young and you can accumulate an amazing trove of merit like these young ones at the extensive water and light offerings and Shakyamuni Buddha Puja. 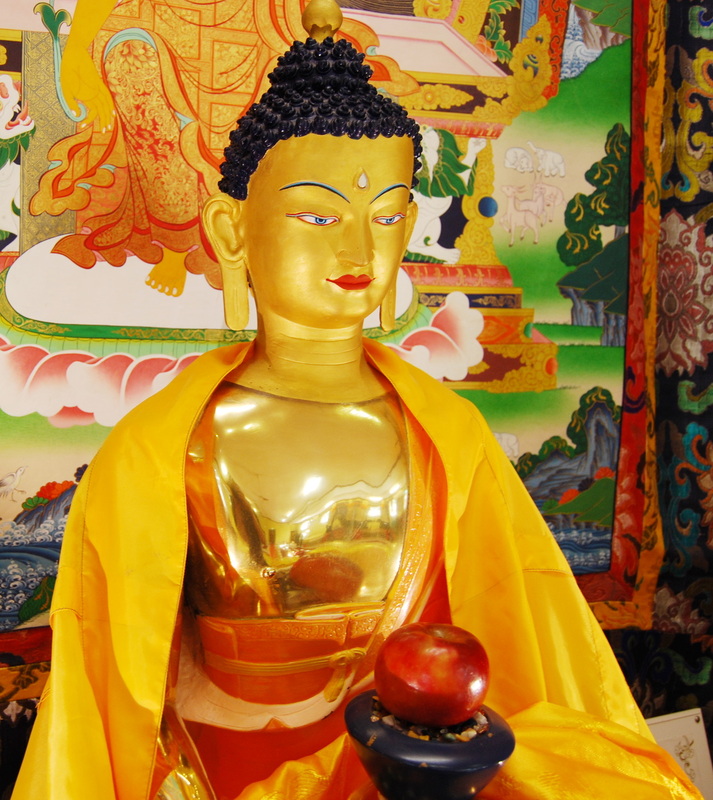 The Fifteen Days of Miracles — from the first day of the Tibetan new year (Losar on 16 February 2018) until the fifteenth, Chötrul Düchen (also called Day of Miracles on 1 March 2018) — commemorate the special time when Guru Shakyamuni Buddha showed miraculous powers in order to subdue the Six Founders, who lacked faith in him, and to inspire more faith in his followers. All fifteen days are merit-multiplying days, when the merit of virtuous actions performed on these days is multiplied by 100 million, as cited by Lama Zopa Rinpoche from the vinaya text Treasure of Quotations and Logic. Each Thursday morning beginning on 4 January Venerable Dekyi will lead analytical meditations on different Buddhist topics such as compassion, loving kindnesss, precious human rebirth, impermanence and so forth. Want to start a meditation practice? Venerable Dekyi will cover different postures, different traditions and establishing a daily practice. The focus is on being mindful of your breath and body. It is known as Shamatha or calm abiding meditation which serves to stabilise our mind by cultivating stillness. Learn about guidelines to better equip us in responding to people and situations. Living in vows lessens and stops the creation of negative karma. It also purifies. It is very important to know what vows have been taken. Over the three weeks, Venerable Dekyi will introduce the Refuge, Laypersons and Bodhisattva Vows in a practical way. The 46 Secondary vows will be introduced. Confusion can arise if we are not clear by the terms ‘Guru’, ‘Lama’ and ‘Teacher’. Ven Dekyi will explain the different types of teachers and their responsibilities and the importance of checking out a Teacher. Venerable Dekyi will introduce the workings of karma and how to change our responses to minimise negativity. Our sense of self pervades our every thought, action and words. Understanding this sense of “I” can free us from a lot of suffering. Examine why having a “chip on the shoulder” or being proud robs us of true happiness. Find out ways to minimise these and other afflictive emotions and desires. Venerable Dekyi will explain what happens when one dies and how we can have less fear if we are prepared. His Eminence the 7th Kyabje Yongzin Ling Rinpoche is the reincarnation of one of the greatest masters in the Tibetan Buddhist tradition. In his last life he was the senior tutor to His Holiness the Dalai Lama. 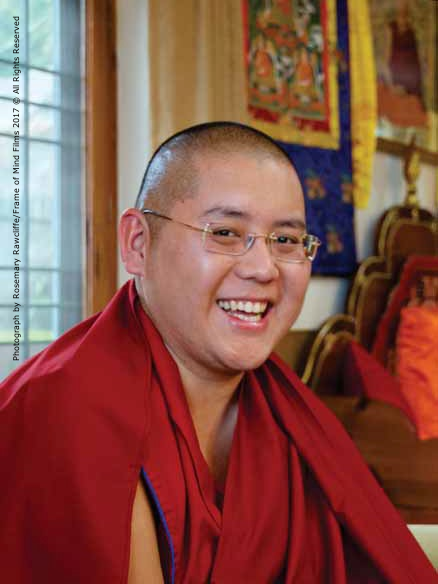 English speaking and a 32-year-old Buddhist monk, Rinpoche presents the 2,500 year-old wisdom of the Buddha in a way that can help today’s busy people lead a more relaxed, meaningful life by better understanding themselves and the way they relate to others. In 2016, H.E. the 7th Ling Rinpoche was awarded His Geshe Degree from Drepung Loseling Monastic University in South India. He continues to be guided by His Holiness the Dalai Lama. 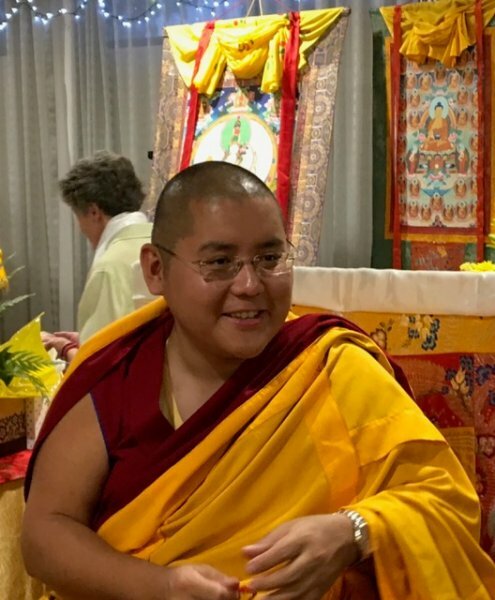 Rinpoche has taught in Asia, Europe, Australia, Canada, Israel and the USA as well as in many Tibetan settlements throughout India, Nepal and the Himalayan regions. His Eminence, the 7th Kyabje Yongzin Ling Rinpoche will teach on the 14 verses by Lama Tsongkhapa which outlines the path to enlightenment. This short text covers the importance of seeking a qualified teacher, developing mindfulness so we better relate to others, using our precious human life to maximise our potential for enlightenment, and aspiring to benefit all beings. 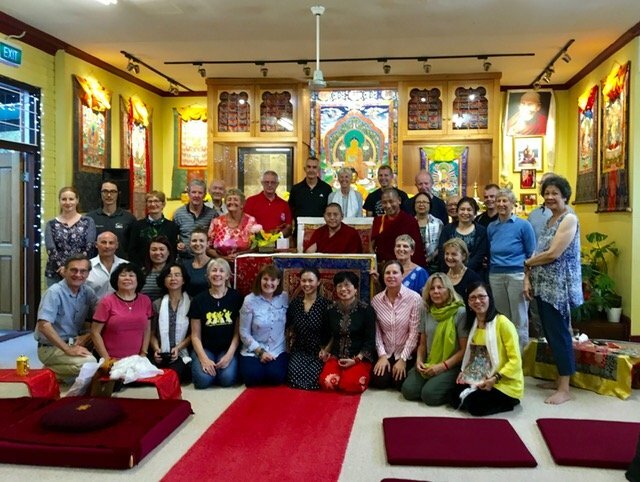 Merit Boxes on Lama Tsongkhapa Day: The International Merit Box Project was created by the FPMT to help cultivate generosity as part of a daily practice. You are encouraged to take home a small metal box in which to put your donations each day, for example, coins in your purse or pocket. The boxes and your offerings are collected once a year on Lama Tsongkhapa Day (12 Dec 2017). 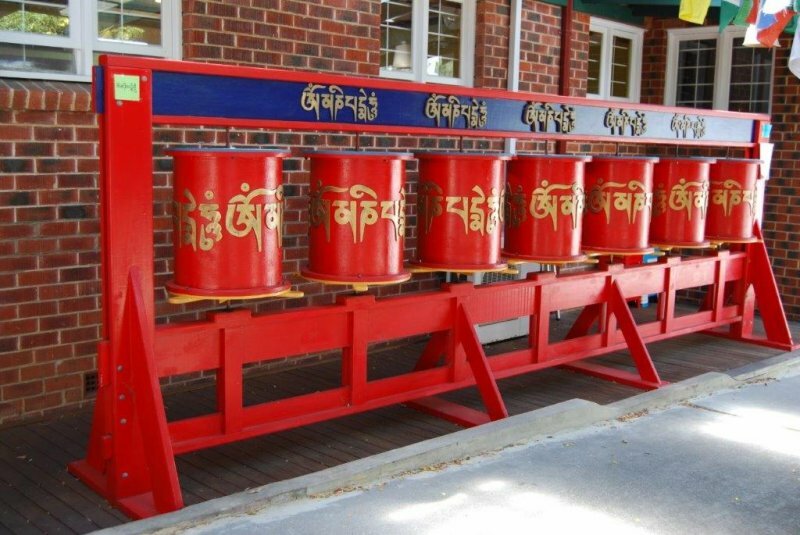 This permits the donations to be combined and on-sent to the FPMT International Office where this project is managed. Follow the link above to read more about it and to see lists of the many beneficiaries of your generosity during the past 15 years. Please return your Merit Boxes to HBC by 12 December. We were blessed with perfect weather on November 18 for our High Tea Event. The afternoon started off with a powerful teaching from Geshela on Mind Training. Geshela spoke on the importance of harmony in everything we do, in our relationships at work, with our family, loved ones and friends and the people we cross path with, each day. “Harmony is the key to Happiness,” Geshela said and the way to go about achieving this is to examine our own minds and our perceptions of the external world and our own internal responses. After the teachings we were all treated to an afternoon of tea served in fine china and a marvellous selection of scrumptious cakes and savouries, all lovingly made by our kind volunteers. Our resident violinist, Susan Di Bona entertained us with exquisite music from the classics, ranging from Vivaldi, Kreistler and Mozart and some jazz. Then some lovely Bhutanese lasses in their gorgeous national dress made a dance offering to Geshela. This was enthusiastically joined in by Matt Whiston, our resident translator and member Poh Choo to the delight and appreciation of the crowd. In between entertainment we had a silent auction and a raffle draw. Fong our green thumbed member provided plants for sale which were eagerly snapped up. It was a most satisfying afternoon and most evident was a spirit of generosity, kindness and good will. We raised $4043 which will go towards Geshela’s current (in December) and future travel next year and HBC’s expenses.